Our Insurance service is PERSONAL. We evaluate and address your needs as an INDIVIDUAL. For over 55 years, Faribo Insurance Agency has been saving Minnesota residents money with top quality insurance at the lowest possible prices. Anywhere in the Minneapolis-St. Paul Metro area, Faribault, Hastings, Lakeville, Northfield or out state Minnesota, Faribo Insurance Agency will customize a monthly payment plan to fit your budget. Plus, you can use a credit card, debit card or check right over the phone. One phone call can save you hundreds of dollars each year! Talk to us right now! Our friendly and knowledgeable insurance professionals are waiting for your call! 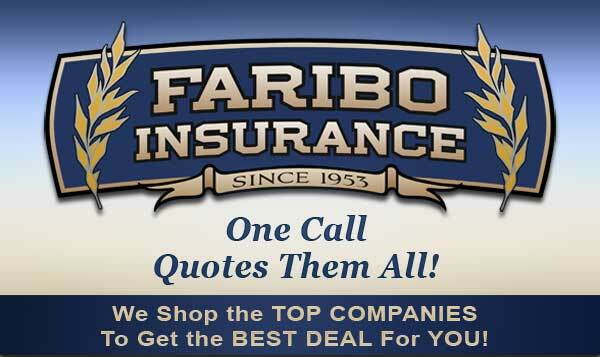 Why Insure with the Faribo Insurance Agency? We serve Faribault and surrounding communities. We have many "A" rated insurance companies to choose from. We have 14 licensed agents on staff. We have coverage to fit ALL your insurance needs. We have easy access and great parking. We are experienced, friendly and helpful.